Jon Thorne studied at the London College of Music with Maureen Smith and Penny Filer, then at the Royal College of Music with Simon Rowland-Jones and later with Mark Knight. Upon leaving the RCM, Jon joined the Bournemouth Symphony Orchestra. Jon left the BSO to form the Bronte String Quartet. Prizewinners at both the Royal Over-Seas League and the Cremona International Quartet Competitions, the Bronte Quartet played at venues such as London’s Wigmore Hall, Queen Elizabeth Hall and Purcell Room, and many festivals throughout the UK and abroad. Jon joined the Badke Quartet in 2009. 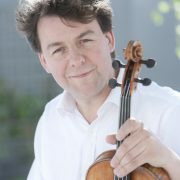 In addition to his work with the Badke Quartet, Jon has played with many of the major orchestras in the UK and currently holds the position of Principal Viola with the Oxford Philomusica. He has also been guest principal with the Philharmonia, London Philharmonic Orchestra, English Chamber Orchestra and Bournemouth Symphony Orchestra. Jon has appeared on numerous film releases, from Batman to Almodovar. Jon also performs on many pop albums, from Amy Winehouse to Primal Scream. He recently appeared as a Soloist on the Naxos release of the Puccini Requiem and Malpiero De Profundis with the Vassari Singers. He is a strong believer in music education and is a Viola & Chamber Music Professor at the Royal Academy of Music, London. Previously he taught viola at the Royal College of Music, the Royal Welsh College of Music and Drama and the Royal Holloway University and is currently viola and chamber music coach for various courses and has given masterclasses at festivals across the UK and Europe. He is also a trustee of Vacation Chamber Orchestras. Jon is a Juror for the European Music Festival for Young People in Neerpelt, Belgium and has been Juror for The Royal Overseas League Chamber Music Competition, North London Music Festival Viola Competition, Trinity College of Music’s John Barbirolli Quartet Competition, the Somerset Young Musician or the Year, Ripon Young Musician of the Year, Hurstpierpoint College and Tiffin School. Jon plays a fine viola by Giovani Grancino from 1692.